As I am writing this, NY is being hit with a pretty intense snow storm. We are expecting about 18 inches by the time the storm is done sometime tomorrow. Schools are closed, roads are impassable, and the weather is just too intense to even go out and have some fun in. We’re pretty much stuck inside again! It’s been quite a winter here, and we’ve put in a lot of hours in the family room together, playing games, doing little craft projects, and watching some of our favorite TV shows and movies. Luckily we got a delivery just the other day that’s helping pass along the time – a DVD that both my boys were excited to watch – a brand new Chuggington DVD, “Brewster Leads The Way”. 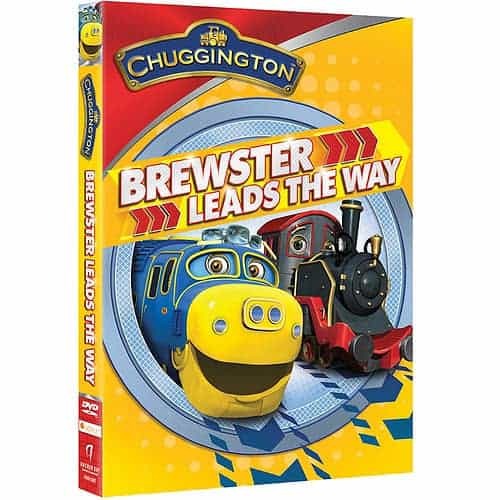 “Brewster Leads The Way” was just released by Anchor Bay Entertainment on February 11th of this year and is sure to be a big hit with the Chuggington fans in your life. We’ve been watching the show on Disney Junior for years. I love that it’s a wholesome show with great lessons on teamwork, friendship, sharing, and other positive messages for kids. My boys love the action and humor of the show. This new DVD highlights one particular chugger named Brewster in six fun “traintastic” episodes. The DVD also has bonus features that include a Badge Quest episode, a music video, as well as coloring and activity sheets to print out and have fun with. This DVD runs 64 minutes, which I think is just the right amount of time to keep my boys occupied and entertained. Their favorite episode seems to be Track Laying Brewster in which Brewster has to figure out how to save his friends from a flood, and fast! If you have a preschooler who loves the show, this DVD would make a great gift for them. You can feel good about letting them watch this one over and over. This DVD is suggested for ages 2-5 with an MSRP of $14.98. There’s even a special version on sale now that includes a die-cast Old Puffer Pete train with an MSRP of only $16.98.